And we’re back with our summer blog feature on flavor profiles. This month it is bell peppers! Who’s ready to jump in with us? Did you know? Each color of bell peppers has its own unique flavor? That’s right, so you shouldn’t say I don’t like peppers but rather I don’t like, orange, red, or yellow peppers individually. Yellow Peppers: The sweetness of a yellow pepper is a bit subtler. Commonly used for its decorative color, you can find it in salads, on a veggie platter, and in cooked dishes. Ever growing in popularity with its sweet and refreshing taste, you’ll be seeing them everywhere now. Red Peppers: Red peppers like all peppers are an excellent source of vitamin C and A – twice as much vitamin C as green peppers, in fact. They are a sweet combination of the yellow and orange pepper, but still, maintain the savory taste of a green pepper. They are suitable for all dishes from raw and sliced for salads or sandwiches, to cooked into sauces, soups, stir-fries, stuffed and other hot dishes. Keep the stem attached because they continue to ripen on the vine and absorb moisture for several days. 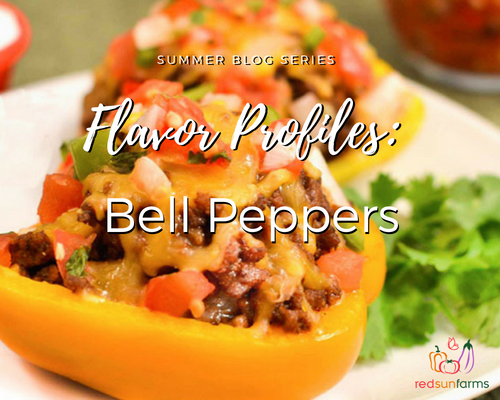 Looking for some cooking inspiration with Sweet Bell Peppers? They pair particularly well with eggs, so try them in our Bell Pepper Vidalia Onion Strata or in our Ham, Red Pepper, and Mushroom Quiche. The bold color of peppers makes a statement in any dish, whether it be a veggie tray, or sliced and grilled on a skewer, to being used in sauce like our Red Bell Pepper Sauce. Remember to check back in our recipe section for other tasty ways to use peppers. When selecting the perfect pepper, look for brightly colored peppers that are heavy for their size, with a glossy, smooth, taut, unmarked skin. The skin should be firm but yield gently to slight pressure. The shape of the pepper does not affect the taste. Have a great recipe using bell peppers you want to share? Feel Free and drop us a tag on social media – Facebook, Twitter, Instagram or by contacting us through our website.